Drilling of carbon fiber-reinforced polymer (CFRP) is one indispensable machining operation to produce holes for final assembly of structural parts. Excessive cutting forces during drilling processes will lead to machining defects, such as fiber breakage, burrs, micro cracks, and plies delamination within laminate. This paper aims to simulate the variation of instantaneous cutting forces in CFRP drilling considering the influences of fiber orientation, machining parameters, and tool geometries. The cutting edges are split into infinitesimal elements; the instantaneous cutting forces are obtained by the accumulation of elemental forces exerted on all engaged elements. The overall cutting forces are the combination of forces contributed by the cutting lips and chisel edge using different machining mechanisms; oblique cutting and mechanistic modeling approaches are applied to the cutting lips while the principle of contact mechanics is adopted for the chisel edge. An integrated artificial neural network (ANN) and genetic algorithm (GA), ANN-GA is developed especially for predicting the specific cutting force coefficients, which are functions of the fiber orientation and can account for the variation of cutting forces. Meanwhile, the change of geometrical parameters along the cutting lips is analyzed, and the effects of fiber orientation and tool geometries are integrated in the model. Results showed the proposed model is able to predict the instantaneous cutting forces in CFPR drilling. 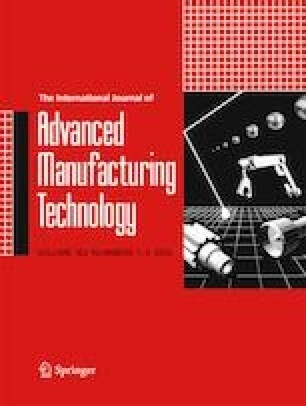 Model predictions agree well with experimental data and are beneficial for optimizing the machining processes of CFRP composite laminates.